If you’re fond of sand dunes and salty air you’re sure to fall in love with Ol’ Cape Cod! If you want to laugh and enjoy a night of brilliant comedy, music, rhinestones, feathers and sequins; then come fall in love with us! 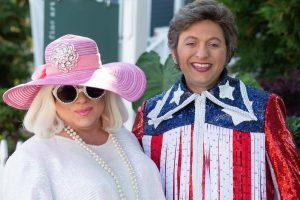 Liberace & Peggy Lee will be settling in to the fabled Pilgrim House for the Summer Season. You won’t want to go home without seeing this outrageous combination of two legendary performers!